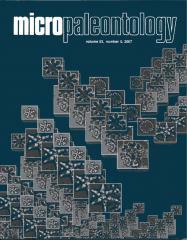 ABSTRACT: Atotal 104 specimens of equal or unequal conjoined skeletons of actinommid radiolarians, where 2 or 3 individuals are conjoined, were recovered from Holocene and Pleistocene sediments in the Japan Sea. Several combinations of ontogenetic stages are observed in the conjoined actinommid skeletons. For example, juvenile actinommidswith one or two concentric spheresmay be fused to adult three or four sphere actinommids in different combinations. Actinomma leptoderma with 3 concentric spheres can also conjoinwith other actinommids possessing four spheres such as Actinomma boreale, Sphaeropyle langii and Prunopyle antarctica. This suggests that these species are closely related and capable of cytoplasmic fusion during stages of skeletal deposition. The species with conjoined skeletons are at present placed in three different genera, but our new results suggest that they should belong in one genus. The conjoinment of actinommid skeletons is thought to be a result of successive skeletal growth through “bridge-growthâ€ and “rim-growthâ€ patterns. The different combinations of skeletal conjoinment stages strongly support asexual reproduction by binary fission. Our observation also suggests that the actinommids can reproduce at the juvenile stage (one or two skeletal spheres developed), not only at the adult stage (three or more skeletal spheres developed). Frequent occurrence of the conjoined forms in the Japan Sea might be related to its habitat inwell oxygenated, cold, deep-water with higher nutrient supplies from the surface.